For other uses, see Regalia (disambiguation). The term can refer to rights, prerogatives and privileges enjoyed exclusively by any sovereign regardless of title (emperor, grand duke, etc.) An example is the right to mint coins, especially with one's own effigy. In many cases, especially in feudal societies and generally weak states, such rights have in time been eroded by grants to or usurpations by lesser vassals. Some emblems, symbols, or paraphernalia possessed by rulers are a visual representation of imperial, royal or sovereign status. Some are shared with divinities, either to symbolize a god(ess)'s role as, say, king of the Pantheon (e.g. Brahman's sceptre) or to allow mortal royalty to resemble, identify with, or link to a divinity. The term crown jewels is commonly used for regalia items designed to lend luster to occasions such as coronations. They feature some combination of precious materials, artistic merit, and symbolic or historical value. 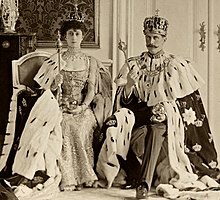 Crown jewels may have been designated at the start of a dynasty, accumulated through many years of tradition, or sent as tangible recognition of legitimacy by some leader such as the pope to an emperor or caliph. But some elements occur in many traditions. Danish globus cruciger. Part of the Danish Crown Regalia. The Holy Crown of Hungary along with other regalia. Replicas of the Crown of Bolesław I the Brave and other regalia. The Throne, Crown and the Sword of Sri Vikrama Rajasinha of Kandy, the last King of Kingdom of Kandy in Sri Lanka. Fly-whisk, which is said to have some of the power of Amaterasu. Seals, such as the Heirloom Seal of the Realm, represented imperial authority under the Mandate of Heaven in China. Regalia can also stand for other attributes or virtues, i.e. what is expected from the holder. Since 690, the presentation of these items to the emperor by the priests at the shrine are a central part of the imperial enthronement ceremony. As this ceremony is not public, the regalia are by tradition only seen by the emperor and certain priests, and no known photographs or drawings exist. Some regalia objects are presented and/or used in the formal ceremony of enthronement/coronation. They can be associated with an office or court sinecure (cfr. archoffices) that enjoys the privilege to carry, present and/or use it at the august occasion, and sometimes on other formal occasions, such as a royal funeral. Sacred ampulla containing the ointment. Spoon for the same ointment. Alternatively, the monarchies of Norway and Sweden have an anointment horn. A Bible used for swearing in the monarch as the new sovereign. Cage with a bird (wren) for wren hunting in Celtic ceremonies. Coronation stone e.g. Stone of Scone or Lia Fáil. Apart from the sovereign himself, attributes (especially a crown) can be used for close relatives who are allowed to share in the pomp. For example, in Norway the queen consort and the crown prince are the only other members of the royal family to possess these attributes and share in the sovereign's royal symbolism. In the Roman Empire the colour Tyrian purple, produced with an extremely expensive Mediterranean mollusk extract, was in principle reserved for the Imperial Court. The use of this dye was extended to various dignitaries, such as members of the Roman senate who wore stripes of Tyrian purple on their white togas, for whom the term purpuratus was coined as a high aulic distinction. In late Imperial China, the colour yellow was reserved for the emperor, as it had a multitude of meanings. Yellow was a symbol of gold, and thus wealth and power, and since it was also the colour that symbolized the center in Chinese cosmology (the five elements, or wu xing(五行)), it was the perfect way to refer to the emperor, who was always in the middle of the universe. Consequently, peasants and noblemen alike were forbidden to wear robes made entirely out of yellow, although they were allowed to use the colour sparingly. The ceremonial Nobat orchestra is a formal requirement for a valid Malaysian coronation. Academic dress is a traditional form of clothing for academic settings, primarily tertiary (and sometimes secondary) education, worn mainly by those who have been admitted to a university degree (or similar), or hold a status that entitles them to assume them (e.g., undergraduate students at certain old universities). It is also known as academicals and, in the United States, as academic regalia. By analogy, regalia is also applied to formal insignia in other contexts, such as the traditional dress worn by Aboriginal peoples in Canada for ceremonial purposes, such as Pow Wow dancing. ^ As in the Upper Harz Water Regale, a royal right granted for use of water resources in the Harz mountains of Germany. ^ McCue, Duncan. "First Nations law student gets OK to wear regalia to call to bar in Ontario". CBC News. Canadian Broadcasting Corporation. Retrieved 15 June 2016. Look up regalia in Wiktionary, the free dictionary.